What a great way to start my weekend! I just found out that the charity room I designed at The Good Shepherd Shelter is including as part of the feature in the spring 2012 issue of TRAD HOME!! The room I designed is the one on the right with the aubergine wall paper! But be sure to check out ALL the rest of the designs in this one of a kind charity design project. How lovely!! Interior designers are constantly problem solving! On an everyday basis we are challenged to think outside the box as well as create functional spaces. Whether the space is too small, too high or even too large, every home has a problem area that becomes “lost space”. We had a few tricks up our sleeves for a recent client’s living room and today we are going to share with you some of our helpful tips! Mid way through the project! The project is still in the works but as you can see the space is already opening up and becoming much more intriguing. We painted the walls a crisp grey, added art cables to display pops of color with canvas art, and got the ladder up ready to be stained a deep espresso! Next, we added the bookcase to the upper storage creating a unique and personal library! The espresso stained bookcase with the ladder added a rich hue against the cool colored wall. Grassy bins were placed next to the bookcase to keep the storage sealed for a clean, organized look. 1. Create an organized and clean looking storage space. With over sized grass baskets, we were able to add color and texture to the area as well as keep clutter hidden. 2. Add an open bookcase to display favorite books, pictures or keepsakes. Although our clients “lost space” was unreachable due to height, that did not stop us from coming up with a way to make this area useful. 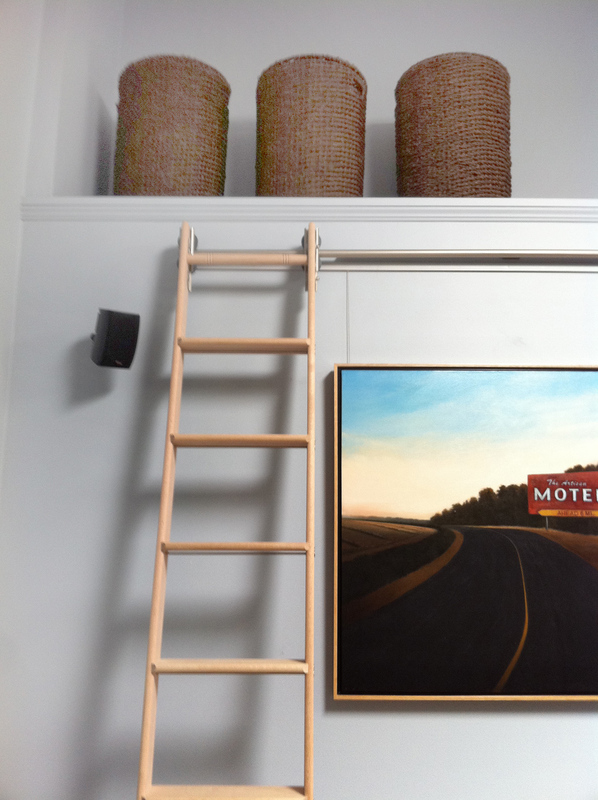 With a custom library ladder we were able to create an interesting and inspired look, as well as provide access to their new bookcase and storage area. Perfect! 3. A gallery wall does wonders to a room! 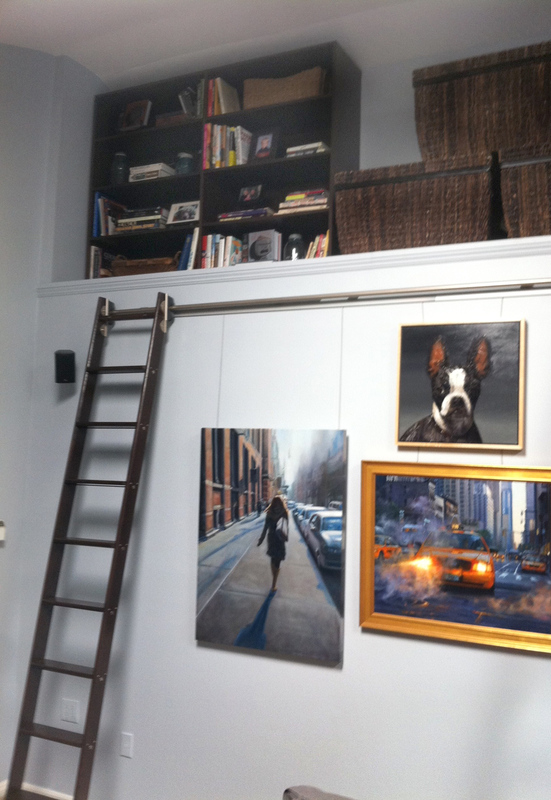 Many homes have walls that are way too long or too high for just 2-3 art pieces. This home had that exact problem and with the help of art cables we were able to hang numerous canvas prints along the wall. The different sizes, shapes and colors added so much dimension and life to this living space. 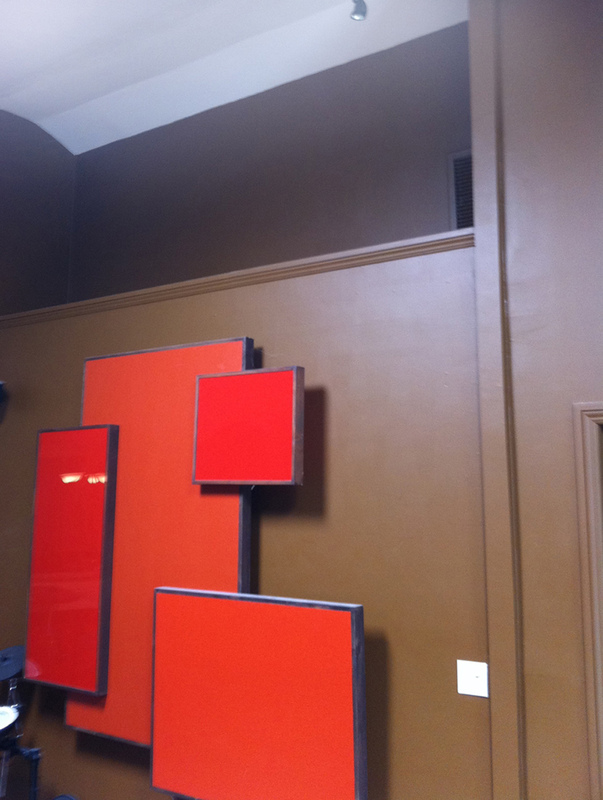 With these three key concepts in mind, we completely changed the mood and use of our clients living room. In case you missed it! Here is a clip of Shirry winning on her second episode of HGTV’s Design Wars!